"Crystal Collection is one of the most reliable and trustworthy vendors I have ever worked with for custom crystal products. From design to pre-production sample to final delivery, we get progress reports from Ms. Shelly Bloom every step of the way. Now, that is reliable customer service." "The paperweights arrived. They are very beautiful and they are greatly appreciated! For us, this made the perfect 'Thank You' gift to people who've played a key role in our construction project." 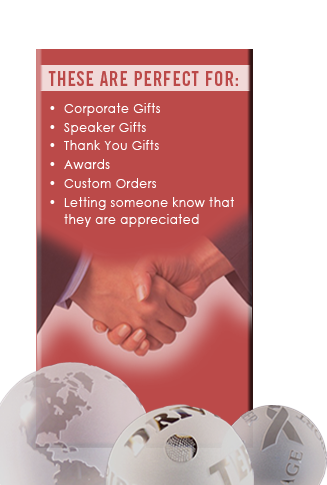 "I am always looking for a unique gift for clients who receive the same old company logo line of gifts... How do I know they like this gift? I see it on my client's desks where it stands out as a one of a kind gift." "For the past six years, I have ordered gifts for my VIP clients from Crystal Collection. I found them to be honest and efficient. All of my clients expressed pleasure at receiving her beautiful products. I plan to do business with them in the future and enthusiastically endorse their product and company."